These satellites are the dispenser satellites for the NOSS-2 triplet ocean surveillance satellites. They consist of the TLD (Titan Launch Dispenser) propulsion module, the SLDCOM (Satellite Launch Dispenser Communications) UHF communication payload. 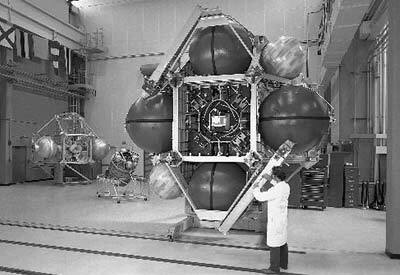 After deploying the three NOSS-2 payloads to a 1100 km × 1100 km, 63.4° orbit, the satellites maneuvered to a 1100 km × 9000 km, 64.3° orbit. The Satellite Launch Dispenser Communications System (SLDCOM) is an R&D bent pipe UHF satellite communications system managed by the National Reconnaissance Office Operational Support Office (NRO/OSO). The SLDCOM constellation currently consists of three satellites in elliptical orbits providing near continuous coverage in Northern latitudes. SLDCOM provides tactical intelligence focused support to a broad community of users consisting of uniformed military services and government agencies for both exercises and operations. The SLDCOM Integrated Communications System (ICS) is a tuneable UHF Receive/Transmit System (225-400 MHz) that provides Analog And Digital Repeater, Digital Store And Forward, And Uplink/Downlink Format, Modulation and Rate Conversion to support TRAP and AJTRAP BCST (Anti-Jam TRAP Broadcast) scheduled broadcasting. It also provides E-Mail System service. The space segment features multiple transponders in elliptical orbits, with a flexible service focused north of the equator including independently tunable frequencies and remote commanding. The ground segment features flexible functional applications that are requirement driven. Tactical equipment present at organizations normally suffices for RF processing, though some specialized applications utilize tracking antennas. Sample missions include: Data Broadcast and Communications TRAP broadcast and Secondary Imagery Dissemination. The 18th Airborne Corps used SLDCOM support during Desert Storm/Shield, with hubs in Washington & Dhahran Saudi Arabia transmitting to multiple deployed units. It used omni-directional antennas to relay Unmanned Aerial Vehicle derived data to field units near-real-time.